There is plenty of dissension regarding the U.S. economy. Whether you are a bull or bear on the economy, it is important to understand that the direction of the stock market doesn't always follow the economy. Those trading near the peak of the market in 2007/2008 will tell you that just as the economy looked the brightest is when it all came crashing down. Similarly, the economy near the 2009 bottom was far from an upswing but that didn't stop the market from making is move higher. Finally, not much has changed since Tuesday's lows, yet here we are screaming higher. The point is, don't expect long-term bullish or bearish fundamentals to define the market in the short-term.If you are questioning the underlying fundamentals behind this move...don't. Wait until we get into 2015, past seasonal support and momentum begins to taper. We live in one of the biggest boom or bust towns in the country (sunny Las Vegas) and take it from us, things are bustling. The strip is packed, and so are the local casinos. We can't help but be optimistic for the time-being. We won't be willing to turn short-term bearish until we see what prices do near 2100 in the S&P. The 30-year bond looks to have turned the corner. Let's buy March 138 puts. Bonds have rallied sharply from the November lows but seem to have turned the corner. With equities on the run, the Fed's intent to raise interest rates, and unattractive yields, we can't help but feel a full retracement of the recent rally is in the cards. Friday's bounce could have been a great opportunity for the bears to establish positions. Rather than selling calls facing unlimited risk, we prefer the idea of buying limited risk puts. 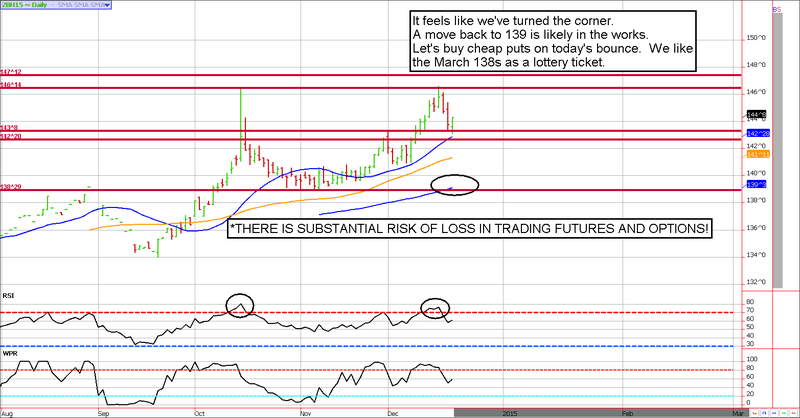 Specifically, we recommend buying the March 139 puts for about 20 ticks or $312. The worst case scenario would be a complete loss of the $312 (approximately) plus transaction costs. But, if prices manage to slide from here, we are hoping this option picks up value quickly. These options have about 64 days to expiration, so the time value erosion should be minimal assuming the bond market doesn't rally. **Consensus:** The ZB has put in a key-reversal and is likely headed lower. We are seeking a price of 139ish. We are seeking 2100 on this run. Perhaps the market has come too far too fast in the eyes of some but we don't recommend fighting the tide. Next week is statistically bullish. Specifically, stats suggest that Monday, Tuesday and Friday (remember Thursday the market is closed) settles higher approximately 70% of the time. In addition, we'll likely see low trading volumes, which tends to promote a "melt up" environment. 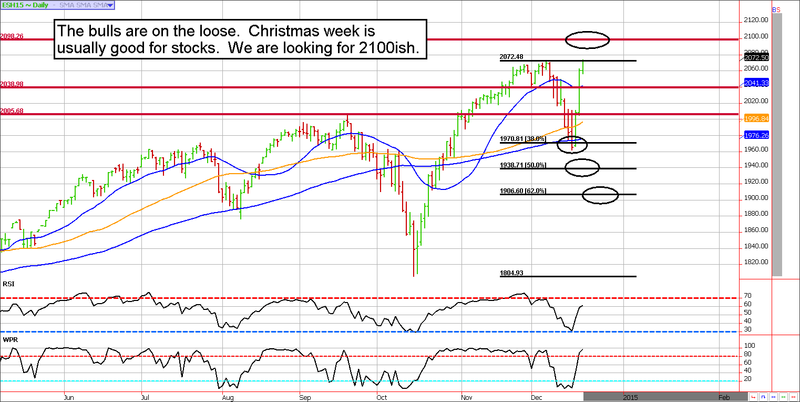 We expect to see 2100 in the ES at some point next week, or in the early part of the following week. Depending on how things look, we'll consider turning bearish (short-term) from there. **Consensus:** 2100 here we come!